Shopping for books on Amazon (what I normally give up for Lent) must be one of the seven joys of the modern world. And if a book is even vaguely notable or popular, Amazon will often knock 10–20% off the cover price. But just occasionally, an Amazon Marketplace trader (basically another retailer listing their wares on Amazon’s website) will undercut Amazon’s price for a new version. I am terribly sorry, We have had a problem fulfilling your order as we have run out of stock. We have tried to find other copies, but alas we can't locate one even from the publisher's agents currently. We sell on a number of other sites and although we update our amazon records daily, there is always a slight discrepancy between our actual stock and amazon stock. As result, we sold our last copy of the above title just before you purchased it. We will request that amazon refund your credit card in full for the transaction today. It’s not that Amazon itself is perfect ... but they seem to offer a more consistent, pleasing customer service. In ten or more years shopping with Amazon - the first books came all the way from the US via amazon.com! - there has been the odd wobble. They once serially delayed shipping a book three weeks at a time for around six months, before I eventually gave up and cancelled the order. But disappointments seem to happen much more frequently with the Marketplace Traders. I've been meaning to play with Wordle for a few months. And tonight while watching a Tivoed episode of NUMB3RS - a show that UTV always seems to schedule for insomniacs who can only fall asleep counting sheep - I finally ran AiB through it. Harvest Service ... in a supermarket! James McCaskill took up the challenge and was filmed for the first year as he sought to revive the parish. A sympathetic advertising agency created a set of ideas under the brand Church Lite ... and their parish website is still live (though hasn’t been updated for quite a long time). It is was great series - though I guess fairly intrusive on the parish’s activities. It’s been a while since Lundwood was in the news: a fire broke out in the church hall roof and gutted the interior as workmen were felting the roof - not an intentional part of Church Lite, though it has provided a chance to refresh the shape and use of the buildings, at a cost. A vicar is shopping for parishioners - down at his local supermarket. James McCaskill will be swapping one aisle for another this Sunday when he takes his harvest festival service to the Asda in Barnsley, South Yorks. Rev McCaskill said: “On a typical Sunday there are far more shoppers in supermarkets than there are worshippers in church. So often Harvest services in Northern Ireland become a celebration of flowers and fruit - admittedly two kinds of thing that God provides for us - but not really typical of the product of ordinary people’s labour. 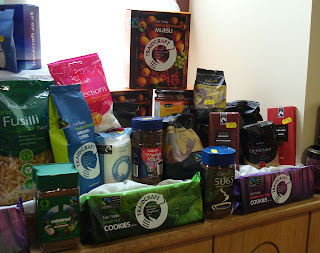 At a harvest service last October up on the north coast, I was taken by the Fair Trade window display ... but did note the absence of Bushmills whiskey from the distillery up the street! Taking harvest to the supermarket seems like a fairly sensible idea (even if it is a gimmick!) for a faith community to consider. Celebrating God’s provision amongst the local produce that most supermarket chains are so keen to remind us of, as well as the product of people’s labour from further across the world. I hope Lundwood’s harvest went well this morning. I think it’s harvest in our church in a couple of weeks time. What’s my harvest? Should I bring a small pile of printouts of Powerpoint slides to set on a window sill? Bedtime reading over the last week or two seems to have settled upon political matters. Truth be told, my bedside table is littered (well, neatly piled high) with any number of genres of unread books, but the political ones have been the ones to hand as I’ve been settling down for the night. While A Telling Year: Belfast 1972 filled me in one some of the local events just before I was born, Jonathan Powell’s Great Hatred, Little Room: Making Peace in Northern Ireland focussed on more recent events. 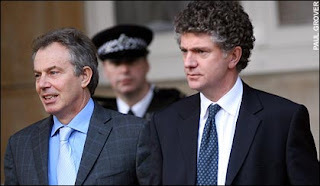 Powell was Tony Blair’s Chief of Staff during his long years as Prime Minister, perhaps his closest colleague and responsible for organising and pushing through Blair’s agenda. As chief negotiator, he spent an incredible amount of time working behind the scenes of the Northern Ireland peace process, and his book provides an insight into the wheeling and dealing that eventually resulted in the current Assembly up at Stormont. Powell makes clear at the start that he has tried not to post-justify the actions and reactions that he details over the ten or more years. Instead, he has tried to explain the reasons and circumstances that provoked the actions at the time. They fell down more snakes and climbed fewer ladders than the average game of Snakes and Ladders! The book is both fascinating and tedious. Political negotiation is a high risk game to play. A lot is at stake, including people’s reputations, and - in Northern Ireland - people’s lives. But the tenacity that drove Blair and Powell to keep going and not give up on the process is amazing. The constant hopping onto a plane to nip across to Belfast or Derry, to meet the political players and resolve crises and inch the process forwards is incredible, and was either unknown or under-reported at the time. While there is a lot of detail included in the book, I was thankful as a reader that sometimes whole months passed in a paragraph. There must have been thousands of meetings over the years. What emerges is a picture of how the local politicians, political parties, and their constituencies of support believe, behave and react. Blair realised that there was a window of opportunity to capitalise on John Major’s successes and mistakes to work with the personalities leading parties when he came to power. David Trimble was not typical of his party or his voters. He was personally willing to step beyond the traditional unionist comfort zone, and while Blair consistently promised to stand by him and offer support when the UUP found it hard to follow him, he eventually fell from power, having effectively sacrificed his own political credibility and success for the good of NI. Gerry Adams and Martin McGuinness too were personally willing - in their case to stand up and lead the IRA away from guns and violence and to commit to a fully peaceful and political struggle. But it took a long time. A lot of words. More drafting than the average leader’s speech at party conference! And probably more misunderstanding than agreement. What jumps out from the extended narrative is the importance of communication and sequencing. You’ve got to keep talking ... even when it’s politically awkward (like the DUP-Sinn Féin back channel) and when the going gets rough (and the Northern Bank gets robbed mid negotiation). Baby steps build confidence and trust, while moving towards the main objective. And if some of the later baby steps fall apart? Well, at least you’re closer to your objective than when you started. A mathematician might want to say that the process “tends towards” peace! It’s a fascinating read. I wouldn’t worry if your brain switches off for some passages and skips parts. There’s even the odd anecdote that’ll make you smile - the one about Major storming out of his own office and realising that Paisley was still in it and refusing to budge amused me, along with McGuinness insisting in repairing Powell’s broken watch - whose good work was undone when the Security Services checked the repaired watch for bugs and broke it again! Powell was frequently wrenched away from family events to jump on a plane to meet up with wobbling politicians. In the midst of the cash for honours affair, Lord Levy, Blair’s chief fundraiser, was arrested. 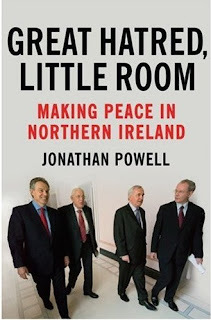 A bit like the Breakout programme I posted about yesterday, Powell’s book is written from his perspective of the peace process. It’s detailed and well-observed, but it could never be entirely authorative. There are players who are absent from the narrative - whose actions didn’t cast big enough shadows to be seen out of Powell’s window. While Clonard Monastry became a useful meeting ground, local clergy are largely absent from the story. And there are plenty of folk who have contradicted Powell’s account - David Trimble took issue with Powell’s account in his review in the Guardian. Powell finishes the main part of his book with an observation about the future. “Assuming the politicians can get past the hurdle of devolving police and justice, there is no reason why Northern Ireland shouldn’t remain at peace and enjoy even greater prosperity. But the burden of history remains, and before the two sides become truly reconciled they need to find a way to deal with the past. So as the current Assembly works its way across the potholes and builds replacement bridges for the ones that have been burnt, spare a thought for the efforts being made behind the scenes to get the show back on the road. While Gordon Brown’s team in 10 Downing Street may not be keen to spend as much effort as Blair on Northern Ireland, the NIO, the parties and other influencers and trusted ears will be burning the midnight oil to keep lines of communication open and find a form of sequencing that everyone can accept. Without doubt, it’ll be more complicated and more convoluted than the media will ever know or be able to say. How can we Breakout from our past? Last Monday night, BBC1 NI broadcast the documentary Breakout at 9pm. You can still catch it on iPlayer for a few more days. The programme tells the story of the Maze Prison escape back in September 1983. Twenty five years ago I was living in Lisburn and just starting P7. Class mates lived a few hundred yards up the road from the Maze prison, and came into school the next morning with tales of prisoners and/or police running through their back gardens. Even at that young age, there was a sense of the terror and danger associated with the break out. The story was told primarily from the viewpoint and through the voices of three of the IRA inmates who had led the jail break - Bobby Storey, Brendan ‘Bik’ McFarlane and Gerry Kelly. Being a documentary and not a current affairs investigation, they told their version of the story, unchallenged. An alternative thread was woven through the prisoners narrative as former prison officer Campbell Courtney provided his perspective. He was shot as he chased the escapees into the surrounding countryside. And the film ended as the camera poignantly panned past the gravestone of Jimmy Ferris, the prison officer who died from a heart attack after being stabbed during the escape. There was a human cost to the escape. In a way it made it all the more authentic. Those mounting the escape saw the prison officers as the enemy; they sucked up to the screws (the BBC used the phrase “embarked on a strategy of false friendliness with prison staff”) in order to get more freedom and access to gather information to aid their escape. Republican prisoners with their political designation and ideals saw themselves as the victims. Not a view or perspective shared by everyone. But still, their view at the time, as it is now twenty five years later. The backlash on the Nolan radio show the next morning and the reaction in Wednesday and Thursday’s Newsletter front pages is a reminder that Northern Ireland does and will struggle with hearing about its past. At last year’s Queen’s Festival, we went to see the powerful play Truth in Translation at the Lyric theatre. And then I read David Park’s excellent novel The Truth Commissioner. Both works make clear that there are multiple perspectives on any conflict and any incident. And like the Gospel narratives, at times the jigsaw pieces will not easily come together. They will rub against each other, partially contradicting, with different emphasis, different interpretation, defining and offering up as many narratives as people and communities. Monday night’s documentary and the reaction to it is perhaps a glimpse of what might face Northern Ireland in the years ahead. The Eames/Bradley group are due to report in the Autumn. Maybe the governments and Stormont will seek to ignore their report? But if the group does suggest ways of dealing with our past, and if those opportunities for telling the stories of history are taken up, we’ll all have to breath in deeply and swallow hard as we listen to uncomfortable, harsh, romantic and surprising tales. But might it help us breakout from our past? I realised on Tuesday that I hadn’t been back in the University Bookshop The Bookshop at Queens since my undergrad days. The Maths section has shrunk back to a single bookcase. Where have all the Schaum Outline books gone? I’ve nearly got more in the Billy bookcases downstairs! Turns out that reading lists have gone out of fashion for the kind of Mathematics and Computer Science courses that I took, with text books and materials able to be found online. We had gone across to the launch of Malachi O’Doherty’s new book, Empty Pulpits: Ireland’s Retreat from Religion. He argues that the drop-off in the supply of priests is more than just a reaction to recent scandals. Yet it’s not that Ireland is giving up on faith altogether. Nor is it wholeheartedly embracing atheism. You can read William's full sermonette over on his blog. 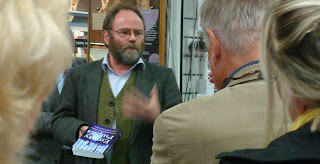 Amid the shelves of books and the tinkling of breaking glass (yes - people couldn’t hold their drink even that early in the evening) there was an eclectic mix of people milling around chatting having listened to William’s introduction and Malachi’s response. Nice to catch up with some Facebook friends in real life! It’ll be a week or two before I get started on Malachi’s book, but I am looking forward to the challenge and provocation that he brings to all his reflections - on paper, in person or on air. And interested to see whether he finds parallels between Catholicism and Protestantism decline in Ireland. An Independent definition of Full Colour! The Independent - as published on its Northern Ireland presses - continues to fluctuate daily between full colour and partial colour/partial black and white. Tuesday’s heralded launch of the Indy’s new full colour edition didn’t measure up to what was promised. Wednesday saw all pages produced in colour (you can tell quite quickly by looking at the colour-coded bands that run across to the top of the pages to show which section you’re in). Thursday dropped back to half and half, with image once again split across the middle line of the paper. And today, they’ve managed to achieve a full colour edition again. Perhaps they should remove the “New full colour edition” splash from the top of the front page until they can actually meet their promise to the customer. Certainly goes some way to breaking the Trade Descriptions Act 1968 in terms of “applying a false trade description to goods”. Or is it covered under the Sale of Goods Act? No matter which, you’d be due a refund if you took your copy back to the newsagent and pointed out it wasn’t as described! What will happen on Monday? Anyone’s guess. Though don’t be surprised if there’s a set of crayons given away with copies of the Indy in Northern Ireland! Easier to navigate than flicking through the 60 or so pages! Normally NI gets left behind with these kind of improvements. The Guardian took a looooong time to finally be able to deliver all the pages (G2 used to be missing a TV reviews) and all the colours to their NI readers. So there will be great rejoicing from the local band of Independent readers. However, when I bought a copy at lunchtime (the newsagent in Church Lane, off High Street) to check out the new, easier to navigate than a TomTom features, I found a “New full colour edition” splash on the front page, a comment from the editor on page 2 (including mention of the new Belfast presses) and ... lots of black and white pages. And lots of photographs and adverts spread across two pages, with one half colour and one half grey. Perhaps the most striking was the picture of Gordon Brown facing David Miliband across the centre crease between pages 10 and 11. Slight technical problem? Much to the amazement of the Indy’s distribution office who confirmed that their (London) edition has a more conventional photo with both halves in colour. Looks like the local first edition of the paper (check for one or no dots below the £1 on the cover) wasn’t printed in full colour. The Independent sold an average of 230,033 copies a day in August, according to the latest ABC figures, down 4% year on year. But around 55,000 of those were overseas sales, and 41,000 were bulk [hotels, trains, airport lounges etc], with only 131,000 sold at full price. That’s a drop of 24% of UK (paid) circulation in two years. Update - same mixed colour/monochrome in the issues being sold in Sainsburys when I filled up with petrol tonight. Update - Wednesday 24th - Printed in full colour throughout in this morning's edition - problem fixed! OK. So I said the post about the Large Hadron Collider rap would be the last on the subject of CERN for a while. But then I read Virtual Methodist’s post from Saturday. So it should be no surprise that the British Methodist Church website is offering new, contemporary hymns that congregations can use as part of their services of worship. And they’re not afraid to tackle more difficult subjects. we need the faith God brings. Something for the technicians and engineers at CERN to hum as they go about their work, dealing with the “slight technical problem” that has halted LHC experiments for the next couple of months. Congratulations to Tyrone on their victory in this afternoon’s All Ireland final. Down in Dublin a couple of weeks ago, the taxi driver who picked a group of us up at the station stopped his cab and, in jest, threatened to throw out one person in the back who had just declared their support for Tyrone in the upcoming semi-final. Funny when the same taxi driver was sent my his firm to take us back to the station the next afternoon, complete with mock upset and calls back to the depot to complain that he’d been sent to drive Tyrone supporters around the city! ... I’m confident of who won - without having to do any complicated cross-cultural multiplication! The things I didn’t get taught at school. Noticed this morning that the Sainsbury petrol station has dropped the price of unleaded petrol by 3p over the last couple of days. The Northern Irish blogosphere is going to get tedious for a while, with the twitterati all turning up for the opening of the Belfast Apple Store in Victoria Square. The first hardy souls started the queue before 11pm last night. 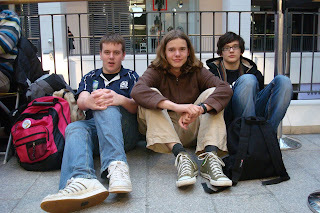 Matthew, Michael, Stuart, Wayne and Karl. Another few arrived after midnight, better prepared with camp seats! And then it was early morning – 5am-ish – when the rest of the queue started to form. Belfast’s not known for queuing – unless it’s for Returns in Marks and Spencer after Christmas – so there was a decent crowd to witness the opening of the brushed aluminium shrine to consumerism! An ability to cheer and welcome seems must be high up the list of skills the interviewers were looking for when they staffed the Belfast store. 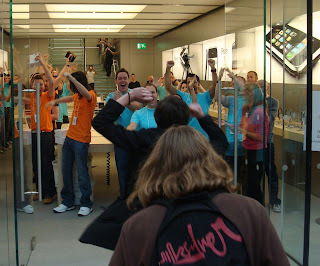 The usual Apple rituals of swarming out of the store before the actual opening to greet and hype up the crowd, before returning in to form a tunnel and hand out T-shirts. The colour of T-shirt marks out your job – a bit like Star Trek (except there are no red shirts). So expect to be met by an orange concierge at the door or the top of the stairs, blue folk will help sell you things and take your money on their wireless credit card machines (no cash tills in the tight-for-space Belfast store - Update: actually, there's one up in the Genius Bar) and you can book in (or just wander up) to see the dark blue-shirted genii who will help you with technical problems when you’re scratching your head. 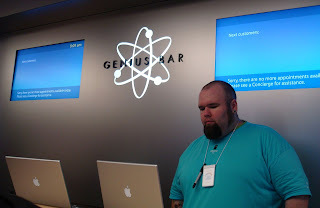 The logo up on the wall behind the Genius bar will look familiar from the recent iTunes update. (Keep me right if I’ve messed up the colours.) Oh, and did you catch all the customers wearing the same skull and cross bones T-shirts? 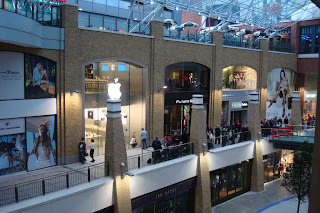 Downstairs is devoted the Apple laptops, iPods, displays; while upstairs you can find accessories, third party products. Headphones and cables. There’s a really cute kids table that’s sure to be a success with parents. 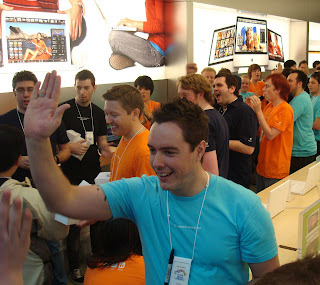 As today’s store opened, they hadn’t received any stock of 16GB iPod Nanos ... which are currently delayed on the Apple website (rumoured to be because Apple brought forward their manufacture schedule in light of Microsoft surprise launch of 16GB Zunes a couple of weeks ago). 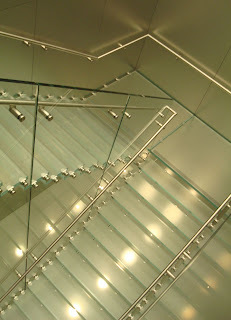 Unlike the bigger Apple stores, the glass staircase is tucked away at the back. It is glass, and it is surrounded by brushed aluminium-looking wall cladding, but it’s not the iconic centrepiece of the store. And it could be tight enough when they squeeze people in for the lunchtime and evening workshops. Great fun to meet up with folk in the queue. The staff were really friendly – though I wonder if their bins will be found full of Red Bull! So no more speculation about the store’s location and opening date. Phew! It’s good to see that the island has eventually got its own store and access to the Genius Bar. 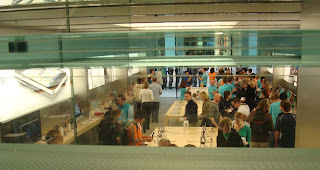 While the main part of the post deals with the store itself, it was interesting to watch Apple at work this morning. Apple’s ability to control is legendary. Until recently, there have been relatively few leaks about product launches. Staff don’t talk about Apple outside work. Even the job application process is shrouded in mystery and non-disclosure. It’s a brand that’s carefully managed, whose message is precisely articulated, not over-exposed, never under-priced. It’s not just that this morning’s opening was well organised. Nothing was left to chance. Meticulous cleansing of the store, with every surface polished and re-polished before the doors opened. A dust-free, smear-free temple to the product range. Consumerism at a different level to House of Fraser or Next. This morning’s message was all about the customers. An experience that should be savoured by the masses queued up outside. Before the doors opened officially, the manager James gave an “iTour” around the store to waiting press and (citizen!) journalists – thanks Tanya. Sounded like James had opened a few stores before today! Probably the last time that the store will be quiet and will have more staff out on the floor than public. But while the media could record his audio tour around the store, there were no interviews. If anyone’s voice was going to be heard on the radio/TV, or anyone’s comments were to be read in the newspapers, it would be the customers. The absence of traditional cash registers – while a practicality to maximise floor space – also removes the reminder that you have to pay for products. That, and the absence of prices on the shelves – you’ve got to pick up an item and touch it, turn it over and explore it to find the price label on the back. It’s like customers are encouraged to fall in love with the product, and then when it’s too late give in to having to pay for it. Is it consumerism at its worst? Or just its most organised? Driven by a desire to take a part of the Apple dream home with them. To buy into the ideal. Reminded me a bit of Disney in Paris back in June. Maybe Apple and Disney have a future together! Maybe not. 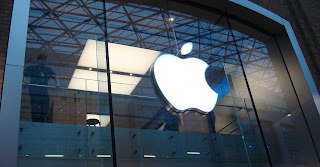 More photos across at Flickr and the Belfast Apple Store pool. And the opening got its 45 seconds of glory coverage on Monday morning's Good Morning Ulster on Radio Ulster - starts at 2:18:26 (available until early on Monday 29 September). How did I miss the Large Hadron Rap last week? One last post about the scientific wonders down at CERN in the Switzerland/France border. Not sure how I missed Kate McAlpine's Large Hadron Rap last week ... but here it is now for your delight. CERN approved the filming in their underground caverns and the lyrical science checks out ok too. Shiny white and brushed aluminium gadgets will at long last be on sale from the new Apple Store in Belfast’s Victoria Square shopping centre from Saturday morning. The grand opening is at 9am on Saturday 20 September. 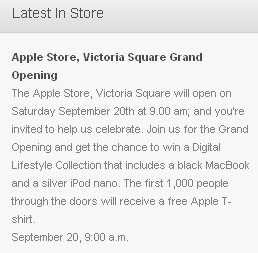 The first one thousand people through the shop doors will all receive a free Apple t-shirt, and there are chances to win a MacBook and an iPod Nano. Update - TBSteve snapped the inside of the store before it opened ... although I'm not entirely convinced it's the Belfast store? Over the weekend, the (now) familiar MCW Residential branding around East Belfast was switched back to Philip Johnston reflecting Johnston’s return to the estate agency business earlier this year. He said that while some estate agents, in particular younger agents, had “enjoyed the benefits of a rising market, and quite frankly during the boom period a stray dog could have sold properties, they have been singularly unimaginative when the going has got tough”. It’s like an adult fairy story. “The people didn’t like the goblin, so they sent him away and took his things. Winter came, and the people realised only the goblin had the gift of fire. They begged him to return, as they were freezing to death. The goblin came back, and they all lived happily ever after”. ... though they were still freezing due to the price of fuel! 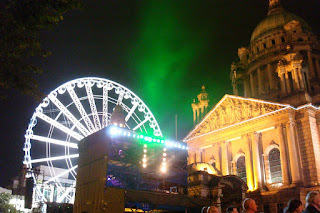 Belfast City Hall and the Big Rickety Wheel made a superb visual backdrop to the feast of sounds that played out last night for Proms in the Park. As Noel Thompson remarked at the start, it’s been dry for the outdoor concert for the last seven years. The Ulster Orchestra bowed, tooted and drummed along with artists like Altan, the impossibly young and impossibly talented Peter Moore (trombone-playing winner of the recent Young Musician of the Year 2008) and operatic diva Cara O’Sullivan. On the other side of the interval, Nancy One and Nancy Two showed off their talents as Niamh Perry got stuck into On My Own from Les Mis, and Rachel Tucker wondered Maybe This Time from Cabaret. The bizarre moment of the night was the orchestral piece “Froms” commissioned from Anna Meredith to be played by musicians across the different venues. 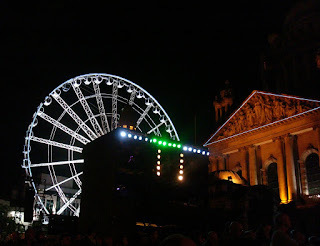 While it may have technically been in time and synchronised (funny to see the Belfast brass players put down their instruments several seconds ahead of the music and big-screen pictures), it was difficult to listen to! The crowd joined in enthusiastically with Rule Britannia, though I discovered that after all these years, I’ve been singing the wrong words! Oh, well. About twenty union jack flags appeared and fluttered for the patriotic songs pageantry near the end, including John Williams’ March from Indiana Jones which sent us all home whistling up the street. A mild night with great music. 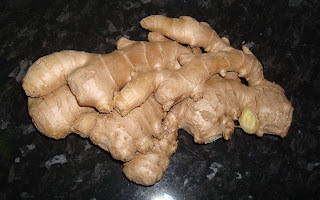 The shopping list said "Ginger". What I didn't realise was that most people break a few sprigs off the big bit in the supermarket, not buy the lot! Banana Mash up = Cooking 2.0? Having just been asked to mash up a banana - I'm wondering if that counts as the start of Cooking 2.0? I don't normally listen to the Today programme on Radio 4. But their coverage of the Large Hadron Collider switch-on at CERN was too promising to miss. I pulled into the work car park on Wednesday morning about 8.24, just as the half eight news had been brought forward. The sports announcer couldn't help himself from cracking an "if they lose it won't be the end of the world" joke, and then John Humphrys managed to squeeze another one in before handing over to Andrew Marr in the CERN control room. And so I stayed sitting in the car for the next ten minutes listening to events unfold. "The most exciting result would be something we don’t expect." ... as well as ironing out a lot of the misunderstandings about black holes. Having gone through all the gags on the previous day - and with the popular press joining in big time - it's a pity that someone didn't ban the "end of the world" jokes on the morning of the switch on. But the opportunity to celebrate and convey the vision, passion and scientific endeavour behind perhaps the biggest science of the year was overshadowed. Instead, a lot of people will instead remember that the world didn't end, people's hair didn't stand up on end (HT to redmum), and that some thing in an underground bunker didn't turn Geneva into a mushroom cloud. "It's like Olympic Taekwondo. Not everybody understands what's going on, it's not always easy to commentate on, but it's very exciting all the same." While I mentioned it back in March, the traditional media and the blogosphere have probably made quite enough comments on Wednesday’s forthcoming events at CERN. 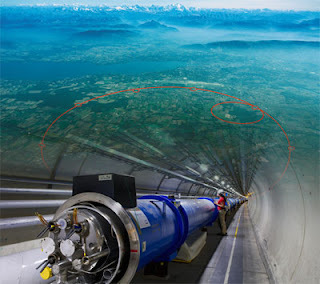 There has been a definite outbreak of science in the airwaves, with BBC Four showing programmes trailing the grand switch on of the Large Hadron Collider and half of Radio 4’s schedule coming from a bunker near Geneva tomorrow. One highlight for the science-fiction fans (folk who imagine about science but mostly don’t actually do experiments) is Radio 4’s Afternoon Play is a Torchwood special, with a familiar cast, music by Murray Gold, and even takes place outside Cardiff! The Torchwood team go to Geneva, where former time-traveller Martha Jones is now working as a doctor at the world's biggest physics laboratory, CERN. Deep in an underground tunnel, a giant particle accelerator is about to be activated for the first time. But something strange is happening. Scientists are hearing voices and collapsing with a strange illness. Is something lurking in the tunnel? I’ll leave you with a joke. Little girl: Daddy. What’s a physicist? Daddy: Oh, that's the man who uses a straw to put the bubbles into the lemonade bottles. 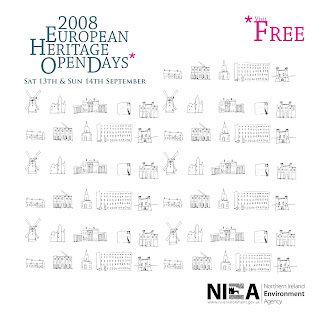 Next weekend marks the annual European Heritage Open Days when the doors are flung open to normally private buildings. The Environment & Heritage Service Northern Ireland Environment Agency helps coordinate the free public access to the local buildings of interest. The 116 page booklet advertising the Open Days is thick and full of interesting sites to visit. Online advertising is limited to a PDF of the full programme (don’t ask why the page numbers in the PDF don’t quite match the printed booklets!) 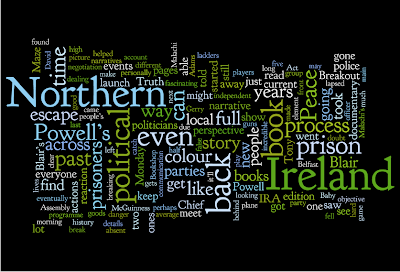 or extracts covering Belfast, Co Antrim, Co Armagh, Co Down, Co Fermanagh, Co Londonderry and Co Tyrone. Note that many buildings are only open on Saturday. Strangely some churches are only showing as open on Saturday but not on Saturday afternoon! The oldest church in Belfast with its elliptical design is 1st Presbyterian in Rosemary Street, open Saturday and Sunday 10am-4pm (with the Sunday morning service at 10.30am). Sinclair Seamen’s Presbyterian Church in Corporation Square has a pulpit like the prow of a ship, and collection boxes like lifeboats. Saturday 10am-5pm and Sunday 1pm-5pm. The Moravian Church on University Road has an exhibition, refreshments and is offering tours around its distinctive Gothic structure. Saturday 10am-5pm and Sunday 1pm-5pm. Although open most of the week anyway, check out another Gothic church. St Peter’s Cathedral (St Peter’s Square) with its Scrabo sandstone and twin spires is open on Saturday 8am-7pm and Sunday noon-6.30pm. You can pick up a booklet detailing an Architectural Treasure Hunt around central Belfast from PLACE in Fountain Square or (on the other side in) the Belfast Welcome Centre in Donegall Place. Freemason’s Hall, 19 Arthur Square was built by Sir Charles Lanyon. Tours on the hour on Saturday 10am-4pm. There’s a one hour boat trip departing from the Big Fish beside the Lagan Lookout that takes in the Harland and Wolff ship yard and all things Titanic. Saturday and Sunday at 2pm and 3.30pm, but booking essential (see brochure for details). There will be hourly tours around Parliament Buildings up at Stormont on Saturday and Sunday 10am-4pm. Best to contact them in advance (028) 9052 8400. Along with an exhibition, there will be living history shows in the Lock Keeper’s Cottage between Stranmillis and Shaw’s Bridge on the hour between noon and 4pm on Saturday and Sunday. A guided walk leave’s Shaw’s Bridge at 11am on Saturday. Stranmillis University College and its grounds are opening up for the first time on Saturday and Sunday 2pm-4pm. You can find out about the preservation of NI’s archive heritage at The Public Records Office down Balmoral Avenue. They are running tours on the hour on Saturday between 10am and 1.30pm. Crumlin Road Goal is looking for new inmates for their hourly tours between 10am and 4.45pm on Saturday and Sunday. You need to book in advance through the Belfast Welcome Centre (see brochure for more details). You’ve heard of Deep Blue? Well this afternoon, Techdigest publishes a report on Deep Green, a Pool-playing robot “developed by a team of Queen's University egg-heads” (their words, not mine). Unfortunately, not Queen’s University of Belfast, but in Kingston, Ontario, Canada. Mounted on a gantry above the table (hint: shift the table before you rack up the balls at the start!) the system features overhead cameras and a robotic wrist that holds the cue and tries not to rip the baize. It made it to the cover story of the IEEE’s Computer Magazine where you can read about the contraption in more detail. Fancy a snack of Tetris? Next time some tells you not to play with your food ... think about the fun you could have with Tetris cookies. I found Malachi O’Doherty’s book The Telling Year (Belfast 1972) quite scary for two reasons. Firstly, it was scary how little I knew about what the Troubles had been like in 1972. Born the following year, only the occasional event has made it onto my timeline. To be unaware of the sheer level of violence, scale of bombings, and the number of people and families affected in those days troubled me. The second scary aspect involved the details of what Malachi personally witnessed and experienced as he lived in his family home, and as he started work as a journalist on The Sunday News alongside colleagues Jim, Stephen, Paddy, Rick and Eddie. While its daily stable mate, The Newsletter, can still be safely described as a unionist paper, The Sunday News was less easily characterised, employed a mixed staff and reported a wider range of opinions and stories. Those familiar with Malachi’s voice off the radio (or his occasional podcast) will hear his tongue in cheek tone each through the pages of the book. It’s a fascinating – if disturbing – read, with enough levity to dilute the more traumatic passages and keep you reading to the giggle at the very end. Update - August 2011 - The Telling Year (Belfast 1972) is now available on Kindle. This morning I pottered across town to Creative Camp Belfast. An un-conference, held in the Blick Shared Studios on the Malone Road. A conference in that a load of people pile round to the one location, sit and listen to talks, ask questions, muse over tea and mini-muffins, and catch up with old and new friends. An un-conference in the sense that the speakers are the attendees, everyone has the opportunity to pitch in with what they know and volunteer a session, and the agenda isn’t finalised until everyone has arrived. I only managed to stay for the morning sessions, but we’d a real range of thought-provoking topics. He analogised that evolution was a strong example of creativity, with genetics providing the randomness and natural selection the editing. In business, the editing will often come from the involvement and review by other people – whether the wider team or clients. 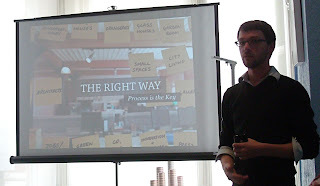 Getting Things Done had been a much requested opportunity for Davy Mac to explain the basics of David Allen’s GTD approach that reverse engineers advanced common sense into a system/methodology. Like a lot of people, I’d prefer if work was less about trying to be a world class fire-fighter, and more about having the peace of mind that the right things were being done at the right time without getting into a complete pickle. So there was talk about projects, physical actions, contexts, treeware vs electronic tools, and the reality that falling off the wagon isn’t the end of the world! But not addressing the chaos of paper and to do lists is not an option. 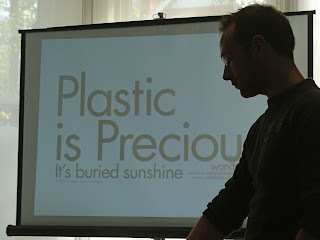 We briefly drifted into the Wonderland world of plastic bottles that would disappear when empty and thrown out (designed to disintegrate and decay into something life-giving rather then toxic), water purification and dresses that dissolve in water. Check out the exhibition (Q&A and workshops) that’s passing through the Ormeau Baths Gallery between 8 October and 8 November for more details. In the final session of the morning, Jamie Neely from Front took a look at Pitch Visuals & Winning Work the Right Way. While intended to be a look at how the website pitching process works, it resonated with my experience of large-scale tendering (ITT/RFI) exercises in work over the last couple of years. Jamie is not alone in noticing that some firms have “a talent of making things look shiny” that helps win work but distracts a client’s attention from bids that are probably technically better less slickly presented. After all, if it’s a third client, a third agency and a third end users, only one third was present when the unpaid-for design visuals (or prototypes/mock-ups) were created. Better to win work by explaining the process you’ll be following to the client, educating them about what you’ll be doing and what they’ll get to show them how you’ll understand their problem, rather than rushing in with ideas. Lots of food for thought, and probably the best morning’s professional development in the last five or six years. Lovely to meet Sharon and chat about life, home schooling, wooden trains and blogging. If you haven’t already, cast your eye across to The Voyage. And good to catch up with Davy Sims who may be did podcasting proceedings, Dave from Amuze/DigMo, Damien, Phil and others. A big, big thank you to Andy, Mairin and the other un-conference un-organisers who did such a good job in rounding up a venue, sponsors, projectors, food and coffee! My one big mistake of the day was pouring a hot cup of sustenance from the flask marked tea ... but on swallowing turned out to be coffee. I suppose the real mistake was not setting it down. But instead I drank it. First cup in about eight years. Yuchh. Sickly. Sore head. 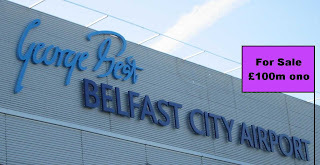 Feel ill.
Back at the end of May I mentioned that Belfast City Airport was up for sale. Having bought BAA, Ferrovial were needing to recoup some cash to lessen their estimated €30bn debt ... though the forced sale of Stansted and/or Gatwick may help too! Ferrovial reckon that their “gains from the sale of BCA will be approximately 85.6 million pounds sterling” ... wish I had a spare airport to sell! When the deal closed at the end of September, the new owners will get to grapple with the issue of the much needed but locally unpopular runway extension that still hasn’t been sorted.